Batteries 24 AA batteries required. Now guaranteed for up to 10 years in storage. Size:AA | Unit Count:24 Duracell with Duralock PowerPreserve Technology - 10 Year Guarantee in Storage From the Manufacturer Thepower you've always trusted now comes guaranteed for up to 10 years instorage. Duracell with Duralock Power Preserve™ Technology means our CopperTopbatteries deliver long-lasting power when you need it most. Many of thebattery-powered devices you use in your home are powered most efficiently byCopperTop batteries.Product OverviewDuracell with Duralock Power Preserve™Technology means your AA, AAA, C, and D CopperTop batteries have a 10-yearguarantee in storage.CopperTop batteries have been engineered to deliver justthe right amount of power for your household devices. They’re reliable sourcesof power for flashlights, toys, alarm clocks and more. 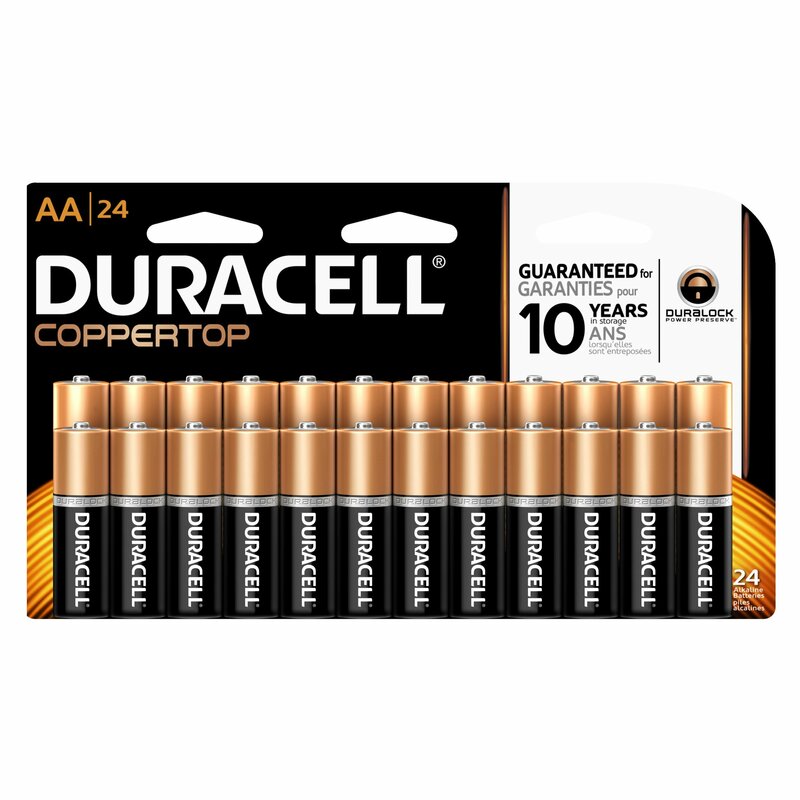 Duracell CopperTopbatteries with Duralock Power Preserve™ Technology are available in AAA, AA,C, D and 9-volt sizes.CopperTop batteries can power most household devices,including:ToysRemote controlsFlashlightsClocksRadiosSmoke alarmsLength ofpower preserve guarantee in storage varies by battery type. Ultra (AA/AAA),CopperTop (AA/AAA/C/D) and Lithium Coin are 10 years. CopperTop (9V): 5 years;Rechargeables and Alkaline Coin Button: 3 years; Hearing Aid (Alkaline): 4years.